Photo for the Mirror by Tim O’Brien Hollidaysburg quarterback Brady Walters breaks away on a run as Brashear’s Nasean Degeunette tries to stop him. LORETTO — Control the line of scrimmage. Win the turnover battle. That combination is a good recipe to win any football game. They were also the two main ingredients that paved Hollidaysburg’s path to a district championship. The Golden Tigers’ offensive line opened up holes for three different backs to rush for more than 75 yards each, and the defensive front completely shut down Brashear’s running game. 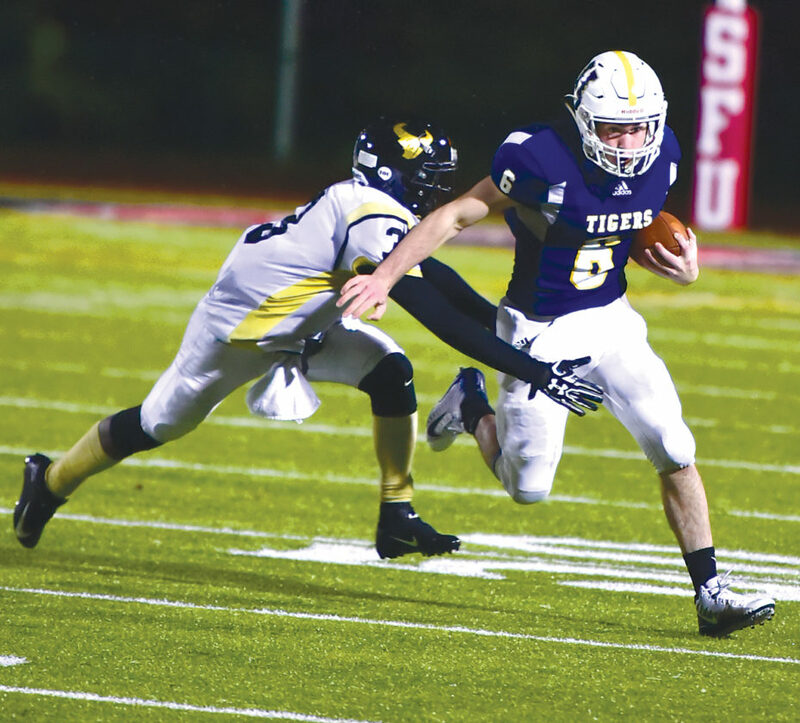 Throw in four takeaways, and it adds up to a 38-7 Hollidaysburg win in the District 6-8 Class 5A championship game Friday at Saint Francis University’s DeGol Field. Brady Walters led the team with 99 yards rushing on 19 carries. The senior signal caller ran for one score and threw for another. Nate Fisher ran for 77 yards on 11 carries, and Hunter Barr totaled 78 yards on 15 carries, including a 19-yard TD run in the second quarter. After Ethan Pinter’s first quarter field goal got Hollidaysburg on the scoreboard, the defense turned Brashear over on the first play of the second quarter. Jacob Sensenig recovered a fumble and returned it 25 yards to the Bulls’ 41. Walters ripped off a 15-yard run on second down then scored on a 6-yard run five plays later. A Sensenig to Barr pass for the two-point conversion put Hollidaysburg ahead 11-0. A short punt on Brashear’s ensuing possession gave the Golden Tigers the ball at the 50. It took just three plays to find the end zone again. Barr followed up runs of 14 and 7 yards with a 19 yard TD run up the middle for an 18-0 lead that Hollidaysburg took to the intermission. The Bulls opened up the second half with a long drive, but a Brock Irvin sack on third down forced Brashear to punt. When Hollidaysburg got the ball back at the Bulls 19, Fisher got the Golden Tigers out near midfield with a 26-yard run on the first play of the drive. He added a 13-yard run later on the drive before Walters found Gus Dellinger wide open out of the backfield for a 5-yard touchdown pass and a 25-0 lead late in the third quarter. Mike Smith’s 48-yard catch and run got Brashear on the scoreboard with 1:19 left in the third quarter before Hollidaysburg sewed up the win with a pair of fourth quarter touchdowns. DeShawn Moss recovered a fumbled snap on a punt attempt in the end zone, and Bryce Martellacci closed out the scoring with a 1-yard TD run. That drive started at the Brashear 3 when the the Bulls backup punter tried to run the ball out of the end zone instead of kicking it away. “Turnovers killed us all year. Going into this season with a lot of seniors, I thought we’d do a lot better, but the turnovers haunted us all year. Just all year,” Brashear coach Don Schmidt said. The Hollidaysburg defense pushed the the Bulls’ running game backwards all night. Brashear’s negative rushing attempts combined with fumbled snaps and sacks totaled negative-18 yards. Townsend finished with 220 yards passing, most of which came late in the game with the outcome no longer in doubt. Hollidaysburg advances to a PIAA 5A subregional game against District 10 champion Oil City next weekend at a District 10 site to be determined. The winner of that game qualifies for the state playoffs, which start the following weekend. H–Pinter 27 field goal, 2:51. H–Walters 6 run (Barr from Sensenig), 9:20. H–Barr 19 run (Pinter kick), 6:31. H–Dellinger 5 pass from Walters (Pinter kick), 3:36. B–M. Smith 48 pass from Townsend (Molinaro kick), 1:19. H–Moss recoverd fumble in end zone (Pinter kick), 5:33. H–Martellacci 1 run (pass failed), 3:34. RUSHING–Brashear, Townsend 10-(-21), Armah 5-7, K. Smith 2-6, Brown 1-(-1), Blair 2-23, Kimbrough 2-(-1), TEAM 4-(-31). Hollidaysburg, Walters 19-99, Fisher 11-77, Barr 15-78, Shawley 1-2, Martellacci 1-1, TEAM 1-(-1). PASSING–Brashear, Townsend 14-30-1-228, Kimbrough 0-1-0-0. Hollidaysburg, Walters 7-14-0-55, Martellacci 0-0-0-0. RECEIVING–Brashear, Blair 1-9, Brown 5-89, M. Smith 5-97, Terry 2-24, Armah 1-10. Hollidaysburg, Dellinger 2-30, Barr 1-2, Drass 1-6, Fisher 1-3, Martellacci 2-14.